Holiday Chex Mix with Maple and Cinnamon | Good. Food. Stories. Something snapped inside my brain when it came to holiday decorating this year. I grew up in a household where traditional white lights ruled the roost, where Colonial-style candles lit every window, and no rainbow of colors dare festoon our Christmas tree. That was how I knew you were supposed to decorate; anything else would be considered tacky, right? But deep inside my nostalgia-obsessed heart has always beat a desire for humongous old-school bulbs, fluffy white artificial trees, and garishly bright colors glowing throughout the house. Thank Target once again for pushing me over the edge. Its $8 miniature white tinsel tree proved irresistibly priced and enough to unleash my retro impulses with a bang: strung with a set of neon-pink lights, it liberated me to deck the halls in a style that would fit right at home in Edward Scissorhands’ neighborhood. Now there are bright orange candles in my windows, a tiny leg lamp (a Minor Award?) on our console, and Chex Mix in my vintage bowls. Come on, what’s more retro than Chex Mix? 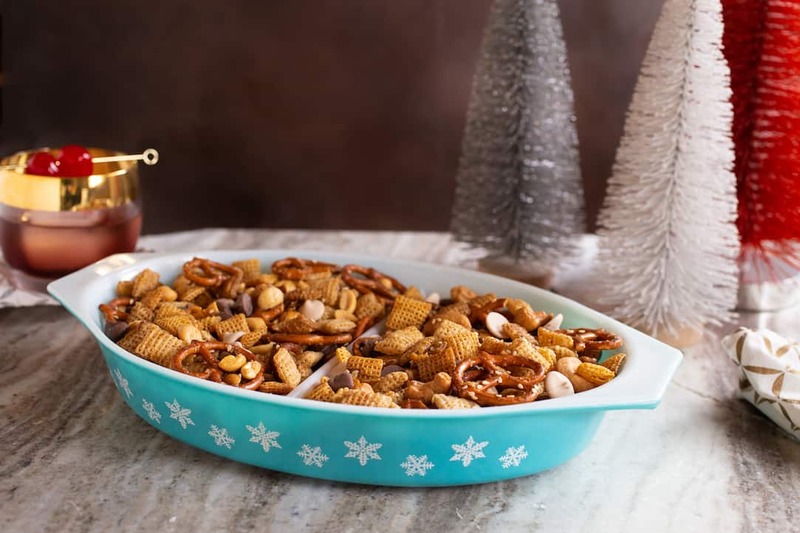 Even though savory Chex Mix drenched in buttery Worcestershire sauce has been making the rounds at holiday cocktail parties since bubble lights and tinsel trees were new and innovative, I felt the holidays called for a blend of sweet and salty. Replacing the Worcestershire with maple and vanilla, and the garlic and onion powder with the traditional warming spices of cinnamon, nutmeg, and allspice, seemed appropriately festive for this time of year. 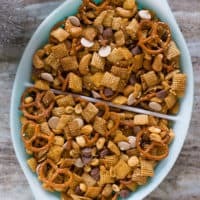 I don’t like to mess around with too many add-ons in my Chex Mix: for me, it’s all about how much buttery flavor those cereal bits can soak up. (Yes, I am the kind of person who eats cereal for breakfast, lunch, and dinner. Why do you ask?) That’s why my holiday version seeks to maximize that sweetly spiced holiday flavor. Salty pretzels contrast beautifully well with the sweetness of maple and spices, sesame seeds add an extra touch of nutty crunch, and a few handfuls of chocolate and caramel chips let you indulge a bit more, because, hey, it’s the holidays. 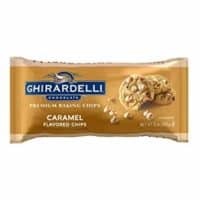 My caramel chip of choice is Ghirardelli; it’s got a richness that beats the pants off regular butterscotch chips. 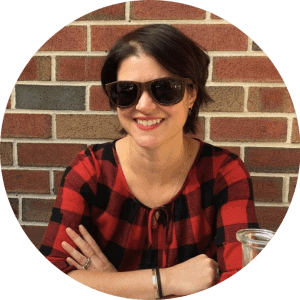 If nuts are your jam, go right ahead and add your favorites to the mix: I’m a fan of cashews or coarsely chopped pecans, but my tree nut-allergic husband sticks to the safety of his peanuts. A full batch of Chex Mix takes 4 ounces (approximately 1 cup) of nuts, so remember to halve that if you’re not going completely nutty. Serve in your appropriately retro Pyrex appetizer dish, of course, and don’t forget the swinging soundtrack! 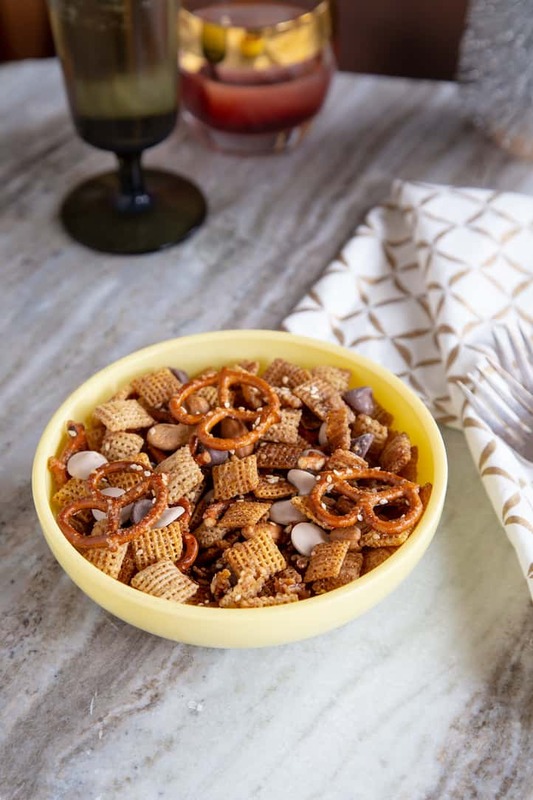 Go retro with an easy holiday Chex Mix recipe blending maple, cinnamon, and nutmeg with cereal, nuts, and salty pretzels. A party pleaser! 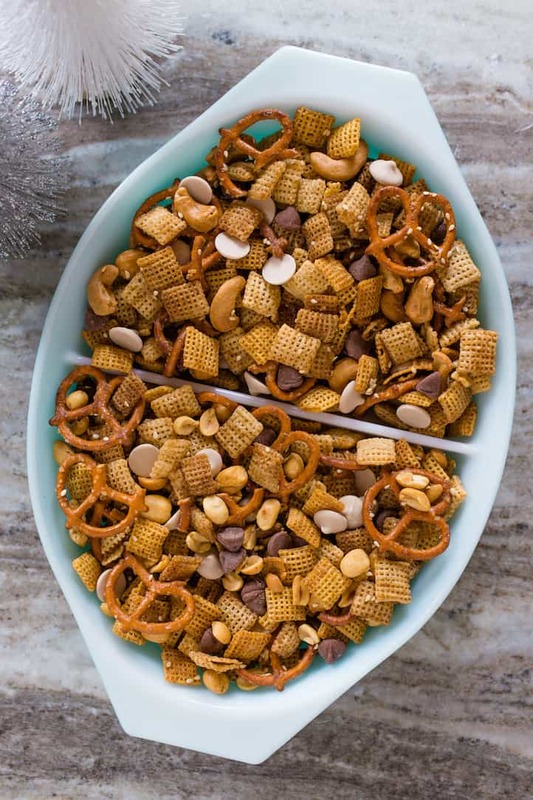 Toss the Rice Chex, Corn Chex, and pretzels together in a large mixing bowl, breaking the pretzels into smaller pieces if desired. If adding nuts to the entire batch, do so here. If you're making half the batch nut-free, wait until you've divided the mixture between the baking sheets. Melt the butter in a saucepan over medium-low heat, then whisk in the maple syrup, vanilla, cinnamon, nutmeg, and allspice. Pour the spiced butter over the Chex and pretzel mix and gently stir to coat. Sprinkle the granulated sugar and salt over the mixture and stir once more until evenly coated. Divide the Chex Mix between the baking sheets, spreading in an even layer on each. If you've waited to add nuts to half the batch, do so here. Don't forget to use only 2 ounces (1/2 cup) on a half-batch! Sprinkle evenly with sesame seeds, about 1 tablespoon per baking sheet. Bake for 30-40 minutes until golden and crispy, stirring the pans every 10-15 minutes to toast the cereal evenly. Remove the Chex Mix from the oven and cool to room temperature. When the Chex Mix is cool, stir in the chocolate and caramel chips. Chex Mix will keep for up to 1 week in a sealed container at room temperature. But let's be real, it'll be gone by the end of the week.